Just a heads-up to all of the Frostgrave fans. The new issue of Miniature Wargames (#410) contains a short interview in which editor John Treadaway asks me about the new Ulterior Motives expansion. More importantly, the interview also comes with two new, exclusive Ulterior Motive cards. Now, I admit, it is going to take some creativity to figure out how to use these, since they are obviously printed on paper instead of card and have no back. Still, wargamers are a creative lot, so I have no doubt players will figure something out! In the seven years I have been running this blog, I have tried to keep it separate from my day job. The Renaissance Troll has always been a place for me to ramble on about my thoughts, projects, and hobbies. 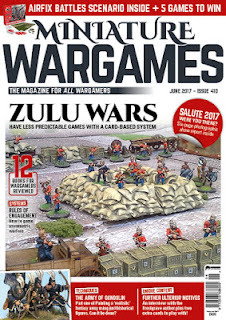 For the most part, it has been a wargaming blog, as that has been my main hobby for the last decade or so. As the years have gone by, however, the line between my hobby and my job has blurred. With the publication of Frostgrave two years ago, the line grew even murkier. Now I’ve pretty much gone and done away with the line completely. So, what does this mean for the world of Frostgrave? Well, it’s good news actually. As I said, my new job is only a part-time position. The rest of my time will be spent as a freelance writer, and I will continue to work on Frostgrave in that capacity. This should mean that I actually have more time to spend on the game. It will also hopefully mean that I will have more time to explore other writing opportunities. I am about to take a bit of a step into the unknown, and the new job is only one part of the life-change about to happen. There will be other things to talk about soon. It’s all a tad scary, but with change, comes excitement, and I am very excited to get started in my new work. What does this mean for The Renaissance Troll? Honestly, I have no idea.